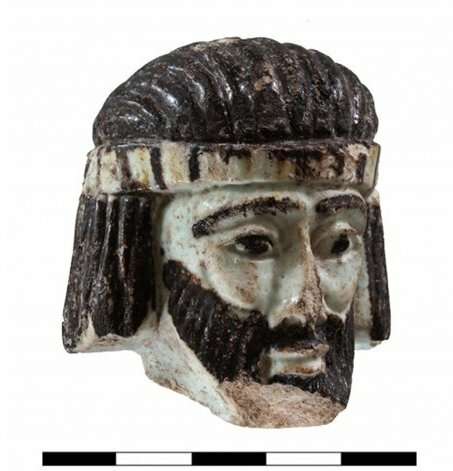 Tel Abel Beth Maacah has been in the news the past week after the announcement of the discovery of a little ceramic head of a bearded man. The piece is quite small. The scale in the picture below is a centimeter scale so you can see that it is about 5 centimeters in size. The piece is thought to represent a king. Some suggestions as to who it may be include King Ahab, King Jehu, King Hazael or King Ethbaal. They were all kings of the nations that surrounded Abel Beth Maacah from the time period that the piece comes from. The piece was found in a layer that has been identified as being from the 9th century B.C. It will be interesting if they find more of the statue this year during further excavations this year. I first saw the tel back in 2012 while touring Israel with Ferrell Jenkins. At that time excavations had not begun at the site, but they were making plans. It is definitely interesting that they found just the head of a figurine. Sheba rebelled against David in 972 B.C. according to one timeline I checked. This would be in the previous century from the time that the little head was deposited. I have been back to Tel Beth Maacah twice since I first visited. In 2015 I visited the site with Luke Chandler and we were given a nice tour of the dig site. I need to do more research and find out exactly where the head was found as I may have been very close to where it was. I took the picture above in 2017 when I again visited Israel with Luke. We did not go up on the tel, but did drive up to a place where we could get some good pictures of the profile of the tel. Now back to packing for my long journey. This entry was posted in Archaeology, Culture, History, India, Travel and tagged Artifact, figurine, Head, sheba, tel abel beth maacah. Bookmark the permalink.